The LAS dataset layer can also be used to control the enforcement of surface constraint features that may be referenced by the LAS dataset. 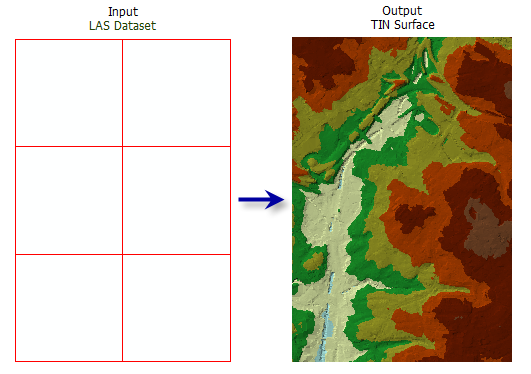 The constraints are enforced when displaying or processing the LAS dataset as a triangulated surface. While the total number of points that a TIN can support can exceed 15 million points, it is recommended that you limit TIN datasets to no more than 5 million points to ensure a responsive performance when displaying and analyzing the data. The TIN node count can be reduced using point thinning methods and controlling the output processing extent. Consider using a Window Size thinning type (thinning_type="WINDOW_SIZE" in Python) when you need more predictable control of how LAS points are thinned in the generation of the output TIN. Specifies the technique to be used to select a subset of LAS data points that will be exported to TIN. NONE —No thinning is applied. This is the default. RANDOM —LAS data points are randomly selected based on the corresponding thinning_method selection and thinning_value entry. WINDOW_SIZE —The LAS dataset is divided into square tiles defined by the thinning_value, and LAS points are selected using the thinning_method. Specifies the technique to be used to reduce the LAS data points, which impacts the interpretation of Thinning Value. The available options depend on the selected Thinning Type. Specifies the technique to be used to reduce the LAS data points, which impacts the interpretation of the thinning_value. The available options depend on the selected thinning_type. PERCENT — The thinning_value will reflect a percentage of the total points in the LAS dataset. This option is only available when thinning_type="RANDOM". NODE_COUNT —The thinning_value will reflect the total number of nodes that are allowed in the output. This option is only available when thinning_type="RANDOM". MIN —Selects the LAS point with the lowest elevation in each window size area. This option is only available when thinning_type="WINDOW_SIZE". MAX —Selects the LAS point with the highest elevation in each window size area. This option is only available when thinning_type="WINDOW_SIZE". CLOSEST_TO_MEAN —Selects the LAS point with the elevation closest to the average value of all LAS points in each window size area. This option is only available when thinning_type="WINDOW_SIZE". If thinning_type="WINDOW_SIZE", this value represents the sampling area by which the LAS dataset will be divided. If thinning_type="RANDOM" and thinning_method="PERCENT", this value represents the percentage of points from the LAS dataset that will be exported to the TIN. If thinning_type="RANDOM" and thinning_method="NODE_COUNT", this value represents the total number of LAS points that can be exported to the TIN. The maximum number of nodes permitted in the output TIN. The default is 5 million. Specifies whether the resulting TIN will be clipped against the analysis extent. This only has an effect if the analysis extent is a subset of the input LAS dataset. CLIP —Clips the output TIN against the analysis extent. This is the default. NO_CLIP —Does not clip the output TIN against the analysis extent. script is designed for use as a script tool.